Metaphorically we speak about driving down the road of life. Following this vision we know our journey can be taken on highways or side roads. I have been photographing and writing columns for well over two years to share with you my windshield view of everyday life in the Peace Arch City. As I pondered emotional issues and political viewpoints I perceived them as merely smudges and smears on the glass we are trying to see through clearly. While driving slowly remarkable people, unique places and great ideas could be better observed from my side windows or rear view mirror. The Northern Light publishers have graciously hosted my picture driven essays about the many roadside attractions and distractions of daily life in Blaine. 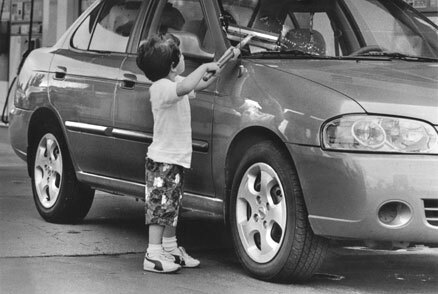 This picture symbolizes my attempts to squeegee off the bugs and road grime from various outlooks of our reality. I have revealed to you deep spiritual insights about neighborly compassion that have inspired my heartfelt affections for our community. I cherished the opportunities to share weekly journals honoring fellow travelers' personalities and their many significant contributions. May God bless us all and I will look for you down the road.